THE HIGH HEEL RACE is a curious phenomenon that has emerged in the last ten years as a popular fund-raising activity. 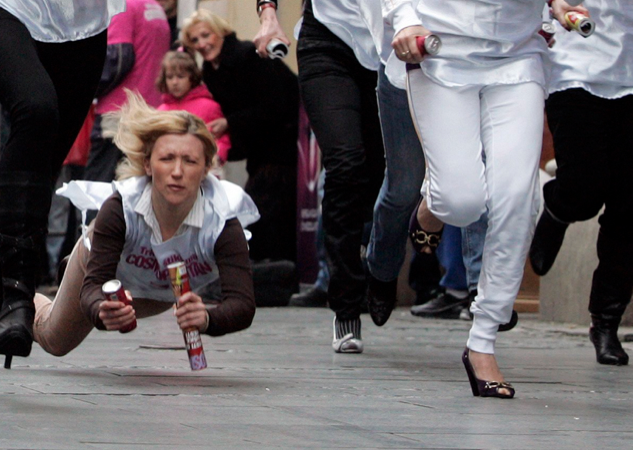 The events require competitors, women (and sometimes men as well), to strap themselves into a pair of stilettos for a 100m sprint across a finish line. 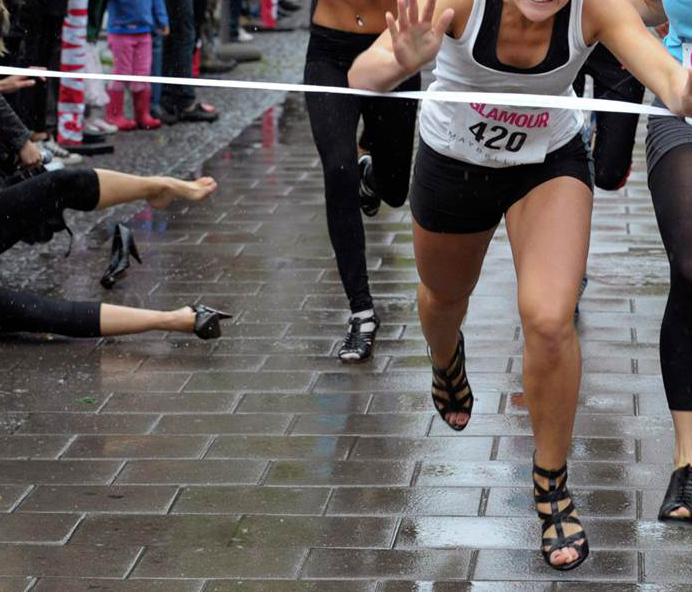 The rules are as follows: heel height must be over 8cm, wedges are not permitted, mules, boots, platforms are all out of the question, so too is any taping, or tying of the shoe to the foot, and first foot forward over the finish line wins. Usually commercially sponsored, or in participation with charity organisations, these events are occurring prolifically across Europe and North America as tools for fundraising and raising awareness. Despite their popularity in novelty, there are some interesting notions of sport, femininity and functionality of clothing-types at play here. The combination of competitive spirit with the classic archetype of the high heel is a somewhat aggressive pairing, and the aesthetic is jarring. The notion of femininity as a sport, could arguably be traced back to subcultural cross-dressing, from early ‘ball’ and ‘drag’ culture in New York from the 1980s onward. Here the competition was social, and intellectual, as it was eloquently captured in the documentary by Jennie Livingstone, ‘Paris is Burning’ from 1990. Drag queens and kings perform in competition for fashionability or wit, vying for trophies that in turn lead to status within the culture. 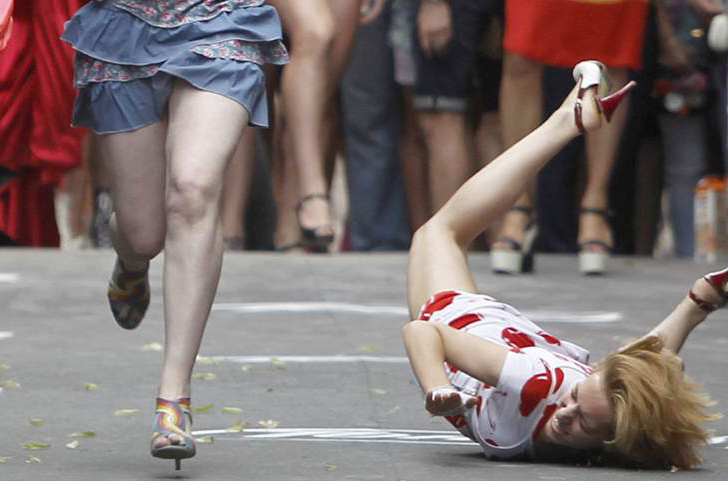 The high heel race bears similarities with this in that dress is used as a tool for competition, but remains difficult to contextualise so clearly. Should this activity be condemned for its hindrances on the female body – and for promoting this? Or perhaps it could simply be read for its novelty and sporting spirit? Moral discussions aside, it is certainly a surreal and head-turning vision – hoards of stilettoed women at sprint-pace down city streets – and one worthy of both note and analysis. High heel race organised by Glamour magazine, Berlin 2006. High heel race organised by Glamour magazine, Kristianstad, Sweden, 2009. High heel race organised by Cosmopolitan magazine, Belgrade, 2008. High heel race organised by Glamour magazine, Berlin, 2006. High heel race organised by Glamour magazine, Moscow, 2008. The creative marriage between James Dyson and Issey Miyake Design Studio has given birth to a series of projects between the two companies which began when Fujiwara invited Dyson to work on the Issey Miyake spring/summer 2006 collection.